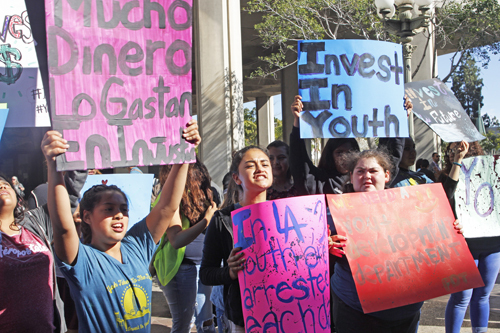 Feeling they don’t have a seat at the table during budget season, over 200 local students rallied outside Los Angeles City Hall Tuesday and invited the mayor and council members to sit down at the dining table they’d set up and “break bread” over a discussion on city youth services. “You say youth are the future yet you don’t invest in our youth,” said 14-year-old Martin Raza as he stood across City Hall. The students are members of the Invest in Youth Coalition which is campaigning to get city officials to invest in a youth development task force aimed at getting funds for community-based safe places and youth programs such as tutoring, mentoring, workforce development, college support and other services. Although 800,000 young Angelenos live in the city, the Youth Coalition points out there is no specific department that addresses their needs. A number of students, sitting with representatives from Mayor Eric Garcetti’s office and several council members, argued that the timing of budget sessions during school hours makes it hard for them to participate in the discussions. The group estimates a $10 million budget allocation for youth development would allow for the creation of 50 programs citywide, something they want to see,. 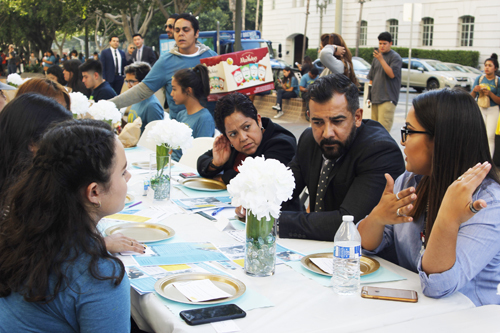 Arlyn Nuñez, 18, of East Los Angeles, told EGP that Tuesday’s City Hall “dining table” discussion is the first step toward making sure city youth receive much-needed services. “We’re in a low-income area, we don’t have many services available to us,” Nuñez said, explaining that tutoring and other after-school programs would benefit the region. According to the coalition, 10,000 youth – ages 19 and under – are arrested annually: most are minorities. The group points to the cities of San Francisco and New York, each of which has a youth development department, as examples of what can be done. “Being a part of an after-school program helps students stay away from the streets and prevents them from getting locked up,” said Lincoln High School student Leslie Sanchez. Garcetti’s representative pointed out there has been investments in youth through HIRE LA’s Youth Initiative and LA College Promise. Through HIRE LA, Garcetti hopes to see at least 20,000 youth employed by 2020. 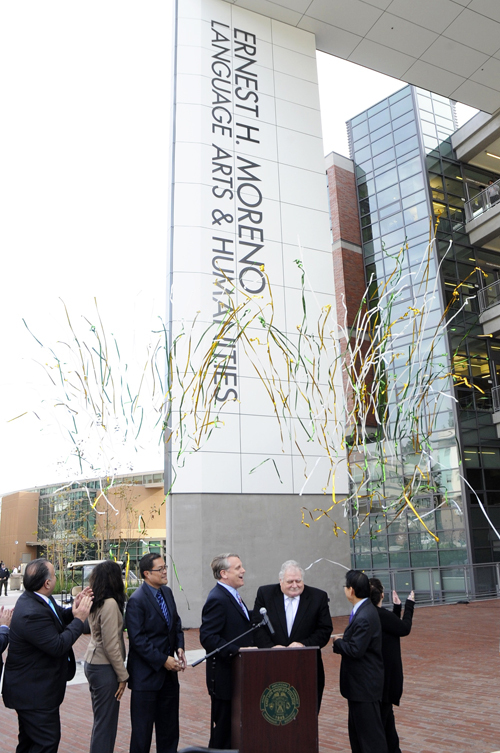 Under LA College Promise, LAUSD students will be guaranteed admission and a year of free tuition at a Los Angeles Community College campus. Councilman Jose Huizar has asked city staff for a report on how the city spends its funds and how it can better prioritize youth services. “It’s a monumental task, but one Councilmember Huizar really wants to see done right,” stated Huizar spokesman Rick Coca in an email, adding that CD14 staff have had a series of meeting with youth advocates, one as recently as Monday. Coca said his boss stands with advocates “in recognizing that the City’s youth stand to benefit the most from a thorough, well-researched comprehensive report on where our resources are going in funding youth services. A [dedicated] youth development department is imperative if Los Angeles hopes to address the issues young people face, said Lou Calanche, executive director of Legacy LA, a community based non-profit that runs youth programs at Hazard Park and the Ramona Gardens Housing development in Boyle Heights. Last year, in response to multiple officer-involved shootings in Boyle Heights, members of 23 nonprofit groups called on city officials to fund a department focused on youth development services. “Boyle Heights is about 50 percent under the age of 25, if youth voices aren’t front and center in times like today, then the city is saying that youth of color aren’t a priority,” said Joel Garcia, director of Self-Help Graphics, a community arts center in East Los Angeles. Several students acknowledged that organizations like Legacy LA and Self-Help Graphics were instrumental in keeping them out of trouble and on the path to college. Araceli Rodriguez, a senior at Garfield High School will attend Sacramento State University in the fall. She told EGP it is especially important for the city to invest in youth at a time when the Trump administration is threatening budget cuts for education and other public programs. Belvedere County Park in East Los Angeles was identified Wednesday by authorities. Sheriff’s deputies responded to a report of an assault with a deadly weapon around 8:25 p.m. on Dec. 28 in the 4900 block of East Cesar E. Chavez Avenue, said Deputy Trina Schrader of the Sheriff’s Information Bureau. On arriving, they saw the man, identified by the county coroner’s office as Anthony Nelson III, lying on the ground in a parking lot suffering from a stab wound to his upper body, Schrader said. Nelson was taken to a hospital, where he was pronounced dead, she said. Coroner’s officials did not have a residence listed for Nelson. Police sought the public’s help Wednesday in solving the murders of two young East Los Angeles women whose bodies were found alongside two Los Angeles freeways a few years ago. The Los Angles City Council, at the request of First District Councilmember Gil Cedillo, approved $100,000 in rewards, $50,000 for each murder, for information leading to the identity, arrest, and prosecution of the person or people responsible for the deaths of Michelle Lozano and Bree’Anna Guzman. Lozano, who was a 17-year-old Lincoln Heights resident at the time of her murder, was last seen on April 24, 2011, and her body was found the next day alongside the Cesar Chavez Avenue offramp from the southbound Golden State (5) Freeway in East Los Angeles, according to a Los Angeles Police Department statement. On December 26 of that same year, 22-year-old Guzman disappeared after walking to a Rite-Aid store at 111 E. Avenue 26, the statement said. Her body was found on Jan. 26, 2012, alongside the Riverside Drive on-ramp to the southbound Glendale (2) Freeway. During the course of the investigations, detectives obtained evidence that links the two murders, the statement said. Anyone with information about the murders was asked to contact the LAPD’s Robbery and Homicide Division at (213) 486-6890. Thirty deserving children from the East Los Angeles area were able to cross off at least one thing on their Christmas list this year, after receiving a gift card to go on a shopping spree Saturday. 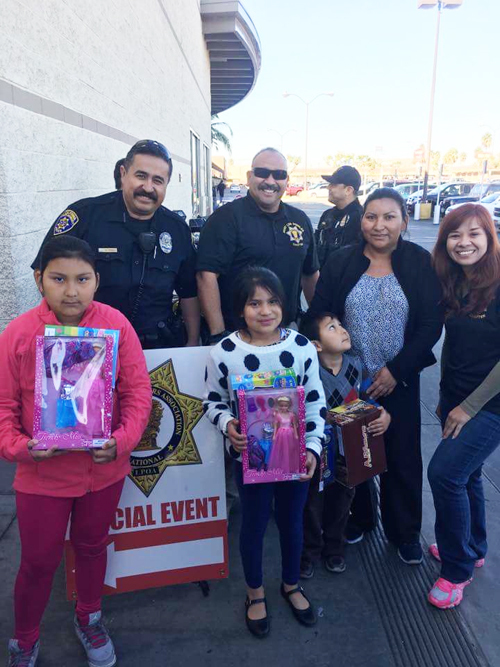 The National Latino Peace Officers Association – East Los Angeles Chapter and the City of Commerce Target Store hosted its First Children’s Christmas Shopping Spree Dec. 3. Each child received goodie bags and a $75 gift card to purchase clothes, shoes, toys, books, movies, games and more. The children were referred and selected by NLPOA – ELA Chapter through various community resources such as churches, local schools, LA County Children and Family Services, and LA County Sheriffs VIDA program.